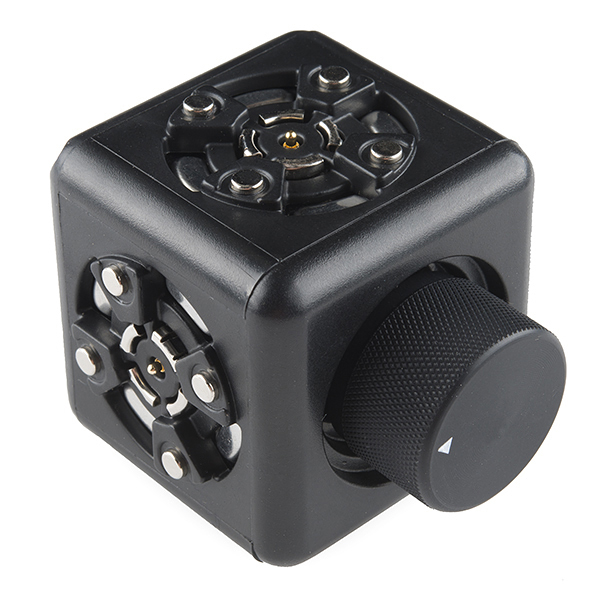 Description: The Knob Cubelet has a potentiometer embedded in one of its faces. It outputs a 0 when turned fully counterclockwise, and a 1 when turned clockwise. Cubelets are magnetic blocks that can be snapped together to make an endless variety of robots. You can build robots that drive around on a tabletop, respond to light, sound, and temperature, and have surprisingly lifelike behavior. But instead of programming that behavior, you snap the cubelets together and watch the behavior emerge like with a flock of birds or a swarm of bees.